A recent survey found that 72% of businesses admitted that they were not as prepared as they needed to be to respond to social media criticism. And if you don’t handle it in the right way, your business can become stained with a reputation of not giving a damn about its audience. In the age in which one disgruntled user has the power of thousands, it could trigger an avalanche of negative posts. So how do you handle a bad review, or people who post something simply out of spite? The one thing you don’t want to do is go back at them with the same level of hostility, because that’s a losing game. On some occasions, your business will take a stand based on its core beliefs that customers and social media users may not agree with. Does that mean that you should go back on your company’s principles in order to quell a social media uproar? No, it means that when social media followers disagree with your stance on a hot-button issue, you clearly explain what you believe in and why you believe in it. Lowe’s dealt with that issue when it decided not to advertise its products on the All-American Muslim TV show, a program on The Learning Channel (TLC). 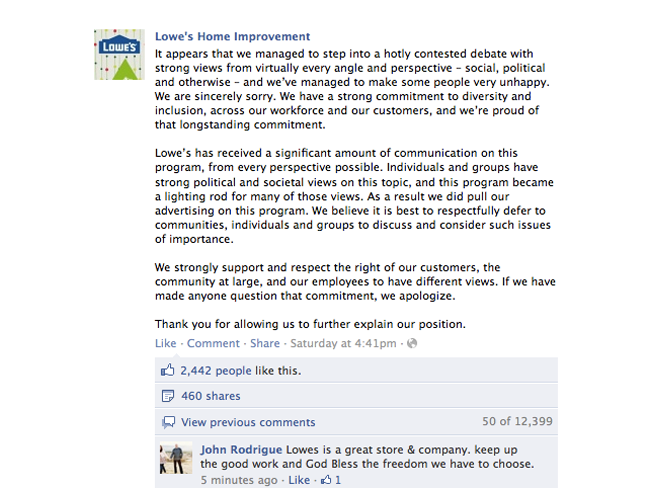 Lowe’s didn’t back off its corporate values position, but did so with respect for the public’s right to disagree, and expressed its willingness to hear divergent points of view. This was a risky response by Lowe’s, but by not hemming and hawing about the reasons it took its stance, and by framing that response with respect for disagreeing views, Lowe’s hit the perfect note. Sometimes you have to take hostile criticism that isn’t true and respond with the facts - and a little bit of humor to take the edge off. Humor can work well when you’re on social media, because it opens the door for your other followers to get in on the fun, which can go a long way toward making them forget about the issue that caused the problem. Instead of ignoring the accusation, or simply stating that the poster was wrong, Wendy’s took another tact, and not only confirmed that it used fresh beef patties, but also provided the date when it started that policy. 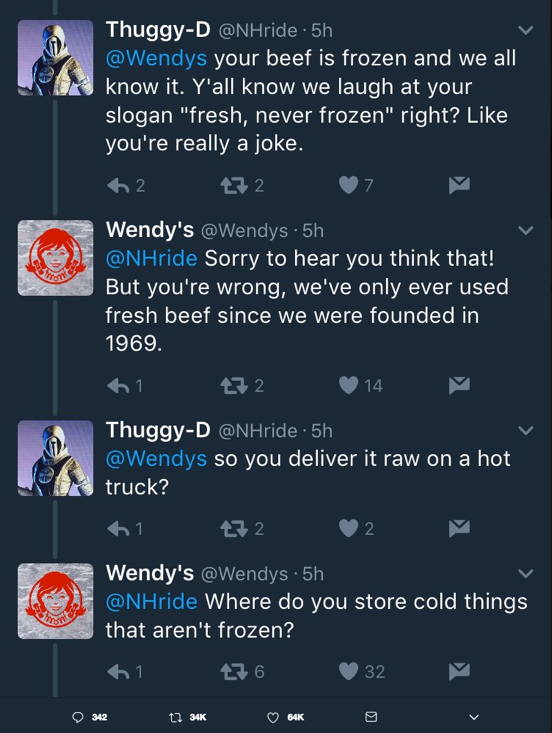 By providing the exact year the ‘fresh, never frozen’ program began, and then using humor to answer the poster’s next question, Wendy’s struck the right note by defending itself against a false accusation, and maintaining a tone that was light enough to defuse the conflict. When a social media user posts something that isn’t true about your business, you can respond with facts and evidence, and where possible, find a way to make a clever quip or use light humor to lighten the mood. Social media is a forum where people often make outrageous claims without support, and that’s especially true when it comes to posters who make claims against a brand. In the example below, the poster doesn’t believe that Everlane’s sweaters cost $57 for the company to make, and he lets the company know in direct and profane terms. 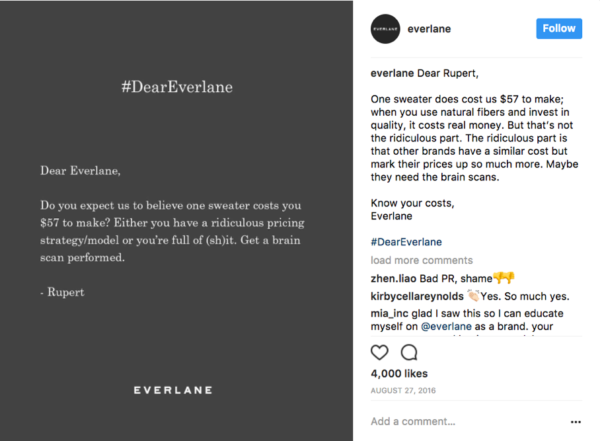 Clearly aware that this type of claim goes to the heart of its business culture and reason for existence, Everlane posted a response that not only explained why its sweaters cost $57, but more importantly, how it managed to keep its prices more affordable than competitors with similar costs. This is a wonderful example of a brand that took advantage of social media criticism to restate its unique selling proposition (USP), which is all about what your business stands for. By clearly explaining its USP in the context of answering a customer’s criticism, Everlane was able to talk about ‘natural fibers, quality and real money,’ without it feeling like the typical sales pitch you hear every day. Clearly, Everlane has staked its branding on the fact that it offers quality sweaters at below-market prices, and it was able to sell that aspect of its business. When you receive criticism about a core value or core principle of your business, it can give you the opportunity to restate your USP to your social media followers. You don’t have to oversell what you stand for, because by simply responding to the criticism with honesty about why your product or service is worthwhile, you send a powerful message to your followers about the value you offer them. While you should strive to respond to as many critical social media posts as possible, you shouldn’t waste time on obvious trolls who are only making negative comments that have nothing to do with real dissatisfaction with your business. Getting into a war of words with trolls is a waste of time, so focus on real customers with real concerns - and if you’re transparent about your core beliefs, use humor to lighten the load, and turn the criticism into an advantage, you’ll strengthen your credibility and boost your branding.